What sort of clock might you want to put on the wall of your computer office? It should be very accurate. You might want it to display 24-hour time. It should automatically and accurately correct for daylight saving time so you can verify your computer and other equipment and clocks are correctly set. You should not drop it behind a heavy cadenza twice a year when you go change the time. For a travel clock, you want a clock that stays accurate even when you change time zones. Most of these clocks work from a 50,000 watt radio signal from Fort Collins Colorado. These are accurate to a few tens of milliseconds. It takes the signal about 7 ms to reach me in Victoria. Neither my desk alarm clock or my watch adjust for that. So those two clocks are 7 ms slow, not really noticeable. Others use GPS (Global Positioning System) satellites. Ironically GPS units can display a time up to 1 second different from the calculated time. Some use short-wave signals. In contrast, the National Research Time Signal broadcast on the CBC (Canadian Broadcasting Corporation) radio network every day at 10AM is 300 ms slow, because it has to be relayed from the NRC (National Research Council) to the network of radio stations and they do not correct for it. With NTP (Network Time Protocol), asymmetric routes and network congestion can cause errors of 100 ms or more. It is usually accurate to within 10s of milliseconds, and reach 1 ms accuracy under ideal conditions. If you have a highly accurate Wave Ceptor watch, you might use it to see how accurate your computer’s NTP clock is. Experiment with different NTP servers until you get the best accuracy. There are wall clocks and travel clocks that keep accurate time by synching with a radio signal from the US government NIST (National Institute of Standards and Technology) WWVB radio signal broadcast from Fort Collins, Colorado. This is how high tech wall clocks and wrist watches maintain perfect time and automatically flip back and forth to and from daylight savings. The time signal optimistically presumes all time zones change to DST (Daylight Saving Time) and back in sync. Colorado broadcasts the current time of day and date once a minute, on the minute. Depending on reception it can some clocks up to 72 hours to fully synchronise. I suspect the reason is reception depends on the weather. In 72 hours, you might get at least a few minutes of the optimum weather to get the clock synced. You could speed the process up by taking the clock with you to work or shopping, since likely somewhere on your trip you will get good reception. If you have completely dead reception, they won’t stay in perfect sync unless you repeat the trip periodically. Because of anomalies such as the fact Illinois ignores DST, the clocks are not always 100% automatic. You have to tell them the time zone and sometimes you must tell them the approximate time. Here is a typical fudge to deal with the fact Illinois ignores DST. The signal from Colorado includes a bit to say whether DST is currently in effect. The Colorado signal does not contain information about DST for different geographical regions that don’t follow the US federal pattern. This means clocks can handle the national days of switchover being changed but cannot automatically handle regions differing from the national standard. The clocks work all through the USA and southern Canada, though you need good radio reception. You might want to borrow a clock to test the reception in the room you plan to keep it. You might get great reception on the Colorado side of your building outside, but hopeless reception inside. Manufacturers call them analog atomic clocks and digital atomic clocks, though there is nothing radioactive in them. They are merely radio-synchronised from a government atomic clock. When I was a child a read a story about a man who devised a scheme to keep all the world’s clocks in sync. People thought him mad. Today you have to be mad to put up with an inaccurate clock or one that keeps forgetting its time every time it loses AC (Alternating Current) power or its batteries run down. Radioworld Canada. Mostly small travel clocks. BRG Canada. Commercial clocks. Ethernet synced clocks. Building-synced clocks. La Crosse WT-3122A Wood. Keeps accurate time by monitoring a radio signal from a US government atomic clock in Colorado. 12 hour analogy display. No temperature display. 31¾ cm (12½ in) diameter. 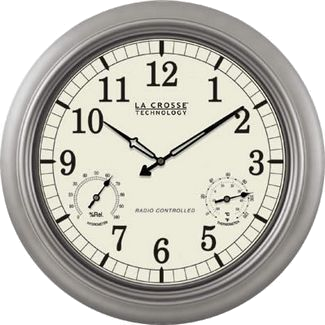 La Crosse WS-8117U-IT-AL Weather Station Wall Clock. Keeps accurate time by monitoring a radio signal from a US government atomic clock in Colorado. It also displays temperature inside and out using an included remote sensor. 12 or 24 hour digital display. It also computes the phase of the moon. 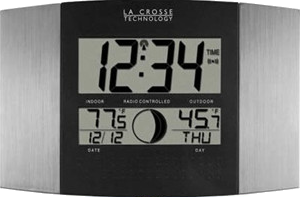 La Crosse WT-3181PL. Plastic. Keeps accurate time by monitoring a radio signal from a US government atomic clock in Colorado. 12 hour analogy display. Relative humidity and internal temperature in Fahrenheit. 45.72 cm (1½ ft) diameter. Atomic resync, red, 29 time zones, 200 meter depth. module 3140. The eye in the upper right indicates how strong the resync signal is. The colour is more muted than in the illustration. This is what I use myself. manual. Make sure you download and back up a copy of the manual. You will not be able to operate the watch without it. Automatically synchs with an atomic clock in North America or Europe, but not Japan. It tries up to six times a day during the night. The syched time is 1 second faster than the CBC radio time signal and two seconds slower than my atomic synced Windows deskop. I am quite surprised that all three are not bang on. 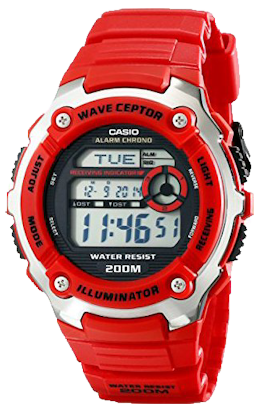 The Wave Ceptor is extremely accurate with the synching, better than a second in three million years. It automatically adjusts DST twice a year. You can turn DST off. The day and month display are in very small type. There was plenty of room for bigger digits. This is by far the most negative feature of the watch. It is very hard to read the day of month display. This is by far the most annoying feature of the watch. I have to put on my glasses, put the watch under a strong light, then hold it at various angles to read the day of the month. The electroluminescent backlight is very dim and does not provide good contrast with the display. Timex’s Indiglo is many times brighter and better contrast. The year is also displayed in very tiny type spaced like 20 16, which is confusing even when you are trying to read the day, not the the year. I think the problem is Casio is recycling components from some other more cluttered design. The display was not specifically designed for this watch. For the sync to work, you have to leave your watch in a window overnight. This means you can’t use it to tell the time when you wake up in the middle of the night. However, I have found in warm weather the watch syncs fine on my wrist as I sleep. Taking the watch outside, pointing it at to the south-east toward Fort Collins and doing a manual resync, results in only two of the three bars, but still an error. My Oregon Scientific alarm clock synchs just fine. It manages to resync automatically only about once a week, but with the quartz movement, it still stays accurate. As the weather has warmed, reception has improved. Now it syncs about every second night, even if I leave it on my wrist. The back plate looks cheaply made — just a piece of sheet metal. The alm (daily alarm) and sig (hourly alarm signal) labels are in microscopic unreadable type. The only way I could find out what they said was by reading the *.pdf manual zoomed. Leave the watch running with the day of the week showing. If you leave it showing your timezone, accidentally jostling the D button will change your timezone and manual sync will not work. To set the date/time etc, hit A C C C. Use B-D to modify a field. Make sure you have DST configured to AUTO and Auto-receive to ON. There are also radio-synced and GPS synced clock is the form of a board you put in your PC to give your PC a super-accurate timesource. You might use it as the timesource for a network of corporate computers. chaotic DST rules. Within the USA there is reasonable order, but elsewhere individual towns can set up their own rules. DST starts and stops at different times. Some areas don’t use it. Individual clocks are not smart enough to know all this lore and keep it up to date. 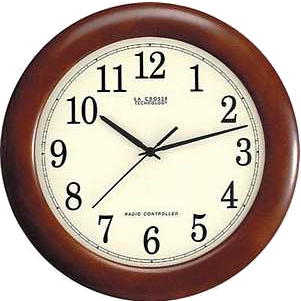 Clocks and watches do not know when you move them between timezones. You have to know the difference in hours between your time zone and GMT (Greenwich Mean Time) to set up your clock, something few consumers know. Broadcast accurate time on WiFi (Wireless Fidelity) networks. Clocks are maintained by the IAPs (Internet Access Providers). Watches use GPS to track location, and hence time zone and whether DST is in effect. Watches automatically download tables to convert latitude and longitude to timezone and DST info. When reception is not available, watches extrapolate the hourly correction and DST changes from the last connection. The problem with this scheme is the radio signal is not powerful enough to penetrate apartment buildings. Your clock may or may not get sufficiently good reception. I suggest that WiFi routers start broadcasting a time signal, perhaps identical to the Fort Collins signal, or perhaps more accurate and simplified. This could be used by all appliances and clocks to automatically track local DST time. The master signal could come from the cable provider. Most these time signal schemes were in invented cira 1960. The creators did not realise the importance of a common global standard so someone with a radio-synced watch could travel the globe freely. GPS is very accurate and provides very wide coverage. It is only a matter of time until a GPS time-synching chip will be cheap enough for wall-clock, watches, PC clocks etc. So I suspect the antique radio-based schemes will gradually fall away.